Do you want to start or advance your guitar playing the right way? Imagine being guided in your guitar playing with someone who walked the path before you. No more guessing which exercises will get you to the next level. No more being overwhelmed of searching online, through books or exercises. 2) how the things you are practicing now are tied together with the overall picture of how the guitar and music works (so over time everything starts to make sense, instead of getting even more confusing). 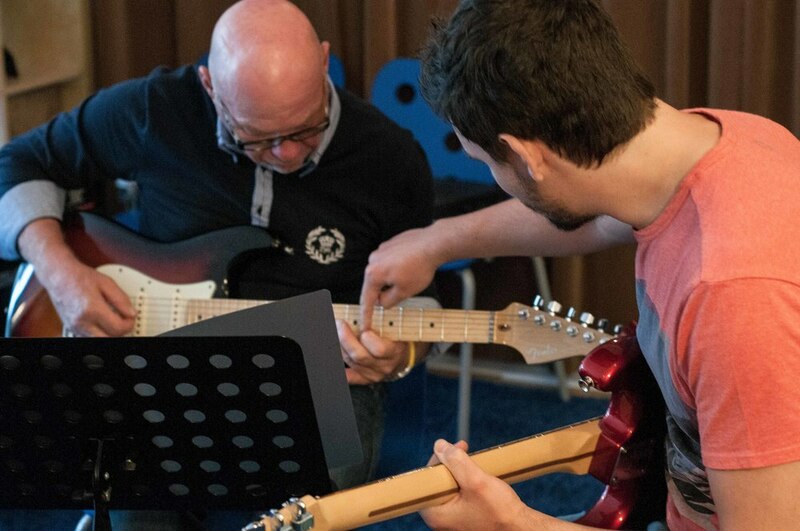 This is exactly what I focus on in my teaching; it's my job to get you to realise what it takes to reach the next big milestone in your playing and how it is tied to the overall bigger picture of what you want to achieve in your guitar playing. Once we've discussed this we set out a path for you with a learning curve that is ideal to your situation. I now accept students from all over the world to study with me at my online blues guitar website. In order to learn more about these lessons, visit my online teaching site at best blues guitar lessons online. I am located in Belgium. If you are interested in taking lessons with me (whether privately or in class format) in my guitar school, visit www.gitaarles.be (dutch website).